The Best Hot Animal Glue Applicating Machine for Case Making! Introducing the most advanced animal/protein glue machine on the market today! Simply feed the cover into the gluer to apply an even film of glue, quickly and neatly. Adjusting two knobs controls the glue film. Operator feeds cover into gluer. Standard gluer presents cover glued side down. 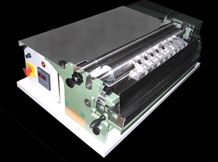 Available in the following roller widths: 20", 32", 42"
Roller Speed feet per min. 65-90" 65-90"
Feed-Table Dimensions 10.25" x 26.25" 10.25" x 38"
Bench Space Requirement 14" x 27.5" 14" x 38.5"